Spongy Opencart Responsive Theme is designed for apparel, fashion designer, shoes, electronics, jewellery and multi purpose stores. Spongy Opencart Responsive Theme is looking good with colors combination. All sub pages are customized. It is very nice with its clean and professional look. 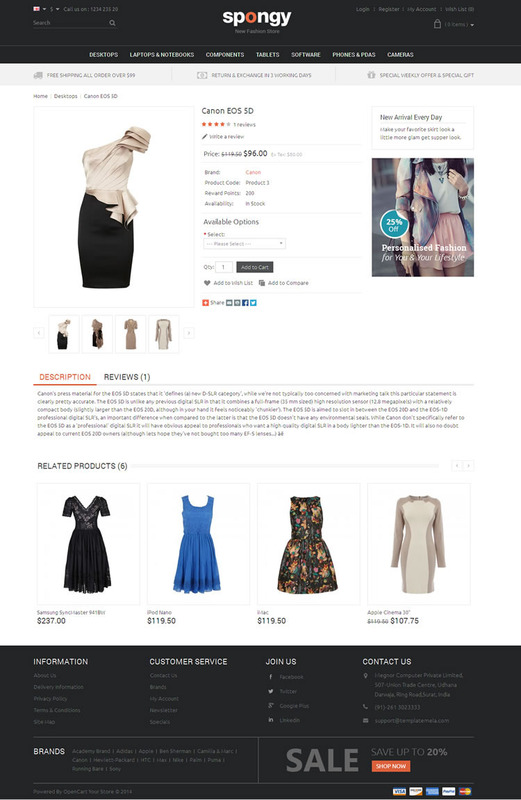 Upgraded theme package for support Opencart latest v2.3.0.x. Minor update with our theme package for support Opencart v2.0.2.0. Fixed small issue for header Call Us text support multi languages. Created totally new theme for support opencart latest version 2.0.1.1.